MALE PARTICIPANT: We’ve got some new information, Chairman. MALE PARTICIPANT: And Japanese television. MALE PARTICIPANT: — and Japanese television, who said that there was the — the level in Unit 3 was at -3 meters, and that’s all they said, and we then got on the horn with General Electric, and they confirmed that the reference level was the top of the active fuel. CHAIRMAN JACZKO: That means that there is three meters uncovered? MALE PARTICIPANT: That puts ahead of 12 meters of the fuel, uncovered. MALE PARTICIPANT: So, I hope I’m wrong, and I hope you tell me a week from now, I got you upset unnecessarily, but we’re looking at that right now. CHAIRMAN JACZKO: Okay, well, assuming that information is accurate, what do we need to be doing? MALE PARTICIPANT: Can we think about that? 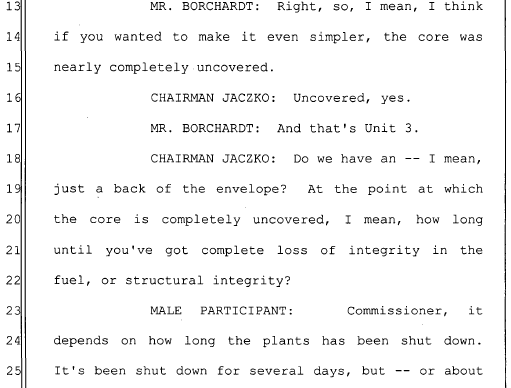 MR. BORCHARDT: Right, so, I mean, I think if you wanted to make it even simpler, the core was nearly completely uncovered. MR. BORCHARDT: And that’s Unit 3. CHAIRMAN JACZKO: Do we have an — I mean, just a back of the envelope? At the point at which the core is completely uncovered, I mean, how long until you’ve got complete loss of integrity in the fuel, or structural integrity? MALE PARTICIPANT: Commissioner, it depends on how long the plants has been shut down. It’s been shut down for several days, but — or about two days. Even so, it can’t be uncovered for more than half an hour or so, or it’s going to be severely damaged.